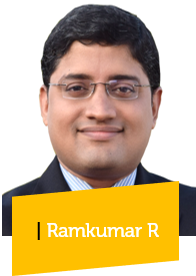 Ramkumar R is a leadership and change management professional with rich experience of facilitating leadership interventions. Ram has almost two decades of experience driving change and transforming businesses at companies like Motorola, Infosys, L&T Infotech and WNS Global Services. He has successfully led a wide variety of functions such as strategy, business consulting, solutioning, marketing, capability creation and product development. Ram holds a bachelors degree in engineering (Gold Medalist) from Delhi College of Engineering and a masters in management from Indian School of Business (ISB), Hyderabad. He is a recipient of the Young Leader and Torch Bearer awards from ISB, has been recognized among top 1% of the alumni across all batches and has been featured in ISB Portraits, a book celebrating top alumni achievements. Ram is also a well-known Indian classical musician who has been performing concerts for more than 25 years. He is the recipient of many awards and scholarships from reputed institutions. He also blogs and writes articles on music for leading magazines like Sruti, The Aalaap and Saamagana - The First Melody.